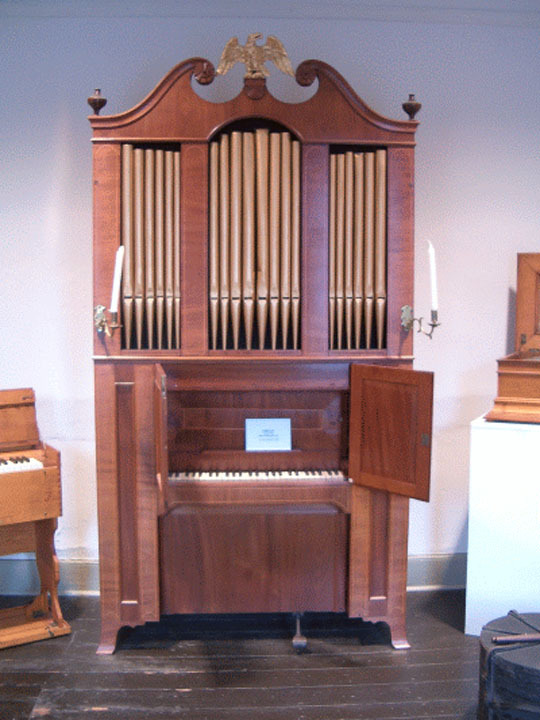 During Tannenberg's life, several other organ builders began constructing instruments in Pennsylvania. These builders either knew Tannenberg personally or at the very least, were able to inspect one or more of his organs for the purpose of copying them. All of the organs constructed by these builders share several characteristics which can be considered "Pennsylvania-German". Among these characteristics are the use of hand-made pipe work in the traditional early German manner, the use of little toes that fit directly into the chest for all wood pipes, a very traditional stop list and a very gentle or lieblich sound of the instruments. Below are the names of several organ builders who worked within the Pennsylvania-German style. Since no Bachmann organ is known to have survived and since he was Tannenberg's direct successor, all the organs he is known to have built are included in the list below. For the remaining builders, only the extant organs are included in the list. Moravian Congregation, Schoeneck, Northampton County - Small 3 stop organ used until 1888. Rebuilt in 1893. Emmanuel Reformed, Hanover - This organ was supposedly begun by Tannenberg and finished by Bachmann although how much of it was actually constructed by Tannenberg is not known. The organ had one manual with eight stops - six of metal and two of wood. It was probably very similar to the 1802 organ in Madison, Virginia. In 1887, it was given to the mission church in Marietta where it was used into the 20th century and then discarded. Salem Lutheran, Lebanon - This organ had a typical five-sectional case similar to the Tannenberg organ in Madison. It was replaced in 1888. Tabor Reformed, Lebanon - Bachmann repaired the organ in 1816 and it was moved to the church's new building in 1844. It was replaced in 1903. St. Michael's Union Church, Hamburg, Berks County - This organ was used until 1918 when it was replaced. Zion Lutheran Church, Harrisburg - The organ was destroyed in a fire on October 21, 1838. St. John's Lutheran, Philadelphia - Completion of an organ begun by Matthias Schneider in 1818. Residence of R. J. Brunner & Family - Small 2 rank chamber organ almost identical to the one built the year before. Altalaha Lutheran Church, Rehrersburg - Christian Dieffenbach. Rebuilt in 1886 by Thomas Dieffenbach who added a pedal with a 16' Subbass and a reversed console. Rebuilt in 1973 by Thomas Eader who removed the pedal and reversed console. Residence of Carol Dieffenbach Kantner - David Dieffenbach. 4 rank organ - possibly built as a house organ. Salem Reformed Church, Bethel - Thomas Dieffenbach. Entirely original but presently not playable. Zion and St. John's Church ("Reed's Church"), Stouchsburg - Thomas Dieffenbach. Entirely original but presently barely playable. Epler's Church, Bern Township - Thomas Dieffenbach. 2 manual and pedal organ. Unfortunately, this organ was recently (late in 2003) destroyed by its owners. This event reminds all of us of the necessity for keeping careful watch on those historic organs that still exist. Rebuild of 1800 J. J. & Christian Dieffenbach organ - Thomas Dieffenbach. Friedens Lutheran Church, Shartlesville - Thomas Dieffenbach. 1 manual and pedal organ. Fairly original, the organ was restored in 1991 and in 2003 by R. J. Brunner & Co. The Krauss family were Schwenkfelders, which, like other plain sects, did not use organs in their churches. For this reason, it is remarkable that they chose to work in the profession of organ building. John (1770-1819) and his brother Andrew (1771-1841) were the first to build organs. Their first instrument was apparently a small house organ built in 1790. In April, 1798, Tannenberg's eldest son, David, Jr. came to work for the Krauss brothers. It is very probable that he was able to share a significant amount of knowledge of organ building with the Krausses. With this in mind, it is no accident that the 1799 casework at Bally bears a very strong resemblance to a Tannenberg organ. Later case designs, however, are of a somewhat different design. The two brothers built at least ten organs before John left the business in 1812 to pursue farming. From this point, Andrew continued working on his own. Their shop was on their family farm located near the present village of Kraussdale. Later, Andrew's sons Joel (1801-1852), George (1803-1880) and Samuel (1807-1904) also worked in the family business. Eventually, however, it was George who took over and built organs on a more or less a full-time capacity. George moved the shop to Palm in 1840. George's son, Edwin (1838-1929) continued working on organs after his father's death. Like Thomas Dieffenbach, Edwin Krauss rebuilt organs that had been originally built by his father and grandfather and his style was a dramatic departure from the earlier German style organs of the first two generations. RECENTLY DISCOVERED! Unknown owner / location - John and Andrew Krauss. Small 3 rank chamber organ now located in the Franklin County Historical Society in Chambersburg, PA. To see a picture, click here. Courtsey of the Franklin County Historical Society. Unknown owner / location - George Krauss. Small 2 rank chamber organ now located in the Schwenkfelder Library in Pensburg. Completion of 1852 John Ziegler organ - George Krauss. House organ - Edwin Krauss. Small 3 rank chamber organ. Entirely original. Located in a private residence. Small 2 rank chamber organ - Originally combined with a pianoforte which is now missing. Now in the R. J. Brunner residence. Small 2 rank chamber organ - This organ is almost identical to that of the c1810 instrument except this organ never had a piano with it. Restored in 1982 by James R. McFarland and is now located in the Priestly Chapel in Northumberland, PA.
House organ for Henry Kolb - Reconditioned in 1982 by Brunner & Heller. Now located in the Goschenhoppen Historical Society, Green Lane. Small 2 rank chamber organ - This organ was completed by George Krauss. Now located in the Montgomery County Historical Society, Norristown.